Although everyone has been told not to judge a book by it’s cover, the face of How to American: An Immigrant’s Guide to Disappointing Your Parents is too eye-catching to ignore. 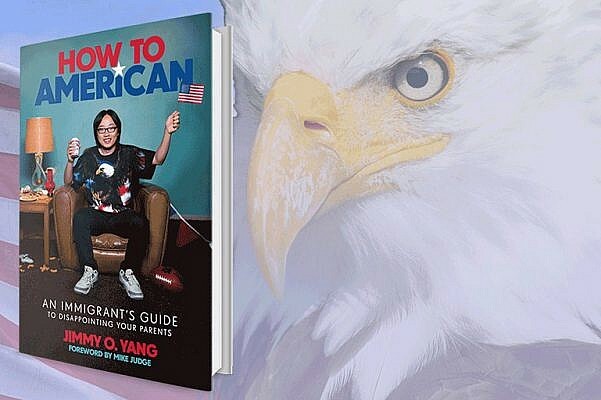 Comedian Jimmy O. Yang sits in a recliner wearing a bald eagle T-shirt, holding a beer and waving an American flag. Look closely, and one will see the Cheetos, Xbox and bong in the background. Part satirical self-help book, part memoir, How to American takes a tongue-in-cheek look at what it means to fit in. Yang penned the book as a window into his experience as a Chinese immigrant and stand-up comedian. Yang added that he officially became an American citizen last year but feels it’s just nominal and that being “American” is a mindset. At the awkward age of 13, Yang and his family moved from Hong Kong to Los Angeles. Armed with school-taught English, Yang navigated high school with the help of BET’s Rap City and Snoop Dogg as a soundtrack. Yang is part of a growing number of minority comedians making a name for themselves on their comedy chops alone. According to a study by the Media, Diversity & Social Change Initiative at USC Annenberg School for Communication and Journalism, Asians represented about five percent of speaking characters in film, television and digital series in 2014. As part of a slim minority, Yang says he’s found community through Asian American-focused comedy groups but doesn’t rely on these groups to promote himself. “It’s important for the media out there to normalize the Asian American experience,” he says. It’s hard not to draw parallels between Yang’s experience and the TV show Fresh Off the Boat, which follows Eddie Huang and his family as they adapt to life in a Orlando, Florida, suburb. For both protagonists, ‘90s rap and hip-hop play a large role in shaping their perception of what it means to be an American. They both also encounter racist stereotypes and have to learn how to move past these narrow interpretations. “For Asian Americans, the American dream isn’t really a thing. The American dream is pursuing something you love and succeeding at it,” Yang explains. This is where the subheadline of the book, An Immigrant’s Guide to Disappointing Your Parents, comes in. Like many Asian Americans, Yang has to choose between meeting parental expectations and pursuing his passion. Yang elaborates on his unexpected start in the entertainment world – as a stripclub DJ – to his growing hunger for stand up. He describes his work at the club as “pairing R&B songs with strippers like a sommelier at Spago suggesting which red goes best with beef Bolognese”. Despite his empathy towards his coworkers at the stripclub, Yang eventually left the business to move to LA to focus more on comedy. Along the way, he introduces readers to his colorful roommates and makes light of the seemingly endless list of audition rejections most actors face. His list of “five non-monetary payments for a stand-up set,” which include, weed, high-fives, unsolicited career advice, one food item on the left side of the menu, and a used copy of FIFA 2013, may resonate with anyone trying to make it in Hollywood or an unpaid internship. Unlike other stories about pursuing the American dream, Yang doesn’t shy away from the struggle inherent in forging a path in a new country and making decisions that don’t jive with parental expectations. From his detailed account of audition rejections, to meticulously keeping track of how much ramen he has left, Yang spared no detail surrounding the day-to-day struggles of life in the entertainment industry. His story comes full circle when he lands a role that takes him back to his home country and allows him to enjoy Hong Kong from an outsider’s perspective. Yang reminds readers that the book is, above all else, a comedy, but one that has a message for those willing to read between the jokes. Photo: Jimmy O. Yang’s Facebook page.